Are you interested in our services or just would like to talk to us about possible solution for your business? 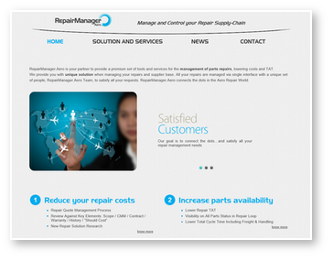 For any business inquiries please reach to sales@repairmanager.aero. Do you want to meet us personally? We are participating in aerospace industry conferences worldwide. RepairManager will attend the AeroSpaceDays in France. More information about the event can be found on the website of the event. RepairManager.Aero will attend the Aircraft interiors EXPO in Germany. RepairManager.Aero will attend the ERA regional airline conference 2014 in Portugal. RepairManager.Aero is looking for Supplier Management Director. Location - Paris, Lyon, Toulouse or Prague. Starting Q2 2014. Position workscope includes building of vendor management team, building of supplier relationships, supporting sales team and IT software development. This position requires 30% time traveling. Position qualification: Master degree in business or engineering, 5 years experience in supplier management position, project management experience, highly motivated, goal and results-oriented, demonstrated ability to deal tactfully and confidently with customer, ability to work with remote teams, finance and sales acumen, IT/soft skills, CRM system knowledge, 6 Sigma/Lean or similar certification, languages - English (professional level), another language is a plus, open minded. We offer fast moving environment of start-up company, opportunity for carrier growth,fixed salary and bonuses, friendly environment, computer + mobile phone, aero world and international environment. RepairManager.Aero is looking for Supplier Progression Manager. Location - Paris, Lyon, Toulouse or Prague. Starting Q2 2014. Position workscope includes building of supplier and customer relationships, supplier project run, supporting sales team and IT software support. This position requires 25% time traveling, 6-12 months internship. Position qualification: Bachelor degree in business or engineering, experience in supplier management position, project management experience, aero background is a plus, highly motivated, demonstrated ability to deal tactfully and confidently with customer, goal and results-oriented, ability to work with remote teams, finance and sales acumen, IT/soft skills, CRM system knowledge, 6 Sigma/Lean or similar certification, languages - English (professional level), another language is a plus, open minded. We offer fast moving environment of start-up company, opportunity for carrier growth,fixed salary and bonuses, friendly environment, computer + mobile phone, aero world and international environment, 12 months contract (CDD) to be converted to long term contract based on performance at the end of the 12 months contract (CDI). RepairManager.Aero is looking for Supplier Progression Trainee. Location - Paris, Lyon, Toulouse or Prague. Starting Q2 2014. Position qualification: Bachelor or Master degree in business or engineering (in progress), experience in supplier management position, project management experience and aero background is a plus, demonstrated ability to deal tactfully and confidently with customer, highly motivated, goal and results-oriented, ability to work with remote teams, finance and sales acumen, IT/soft skills, CRM system knowledge, 6 Sigma/Lean or similar certification, languages - English (professional level), another language is a plus, open minded. We offer fast moving environment of start-up company, internship fees, friendly environment, computer + mobile phone, aero world and international environment, opportunity to work with multicultural teams. If you are interested in these positions, please send your CV and cover letter to lpoint@repairmanager.aero. RepairManager.Aero will attend the MRO AFRICA in the South Africa. RepairManager.Aero will attend the MRO-network CEE Airline E&M in the Central and Eastern Europe and Russia. RepairManager.Aero will attend its customer and partner AerData Conference, in Amsterdam. Find us in RepairManager.Aero booth! RepairManager.Aero will attend the ISTAT Europe 2013, in Barcelona. As we grow, we would like to bring you more detailed and updated information about our products and services, as well as benefits our solution can bring to you as a customer, so see our "Solution & services" page for more details. For more news from our company environment, you are in right section. if you want to share your ideas or comments with us, we will be happy if you reach us via email. All the contacts can be found in the "Contact" section. RepairManager.Aero will attend the MRO Show, in London, September 24-26, with our partner AERDATA. Come to meet us on booth 723 /725! We are hiring people for customers service/vendor management and sales positions. Currently we are seeking for aerospace professionals for various positions in sales, customer service and vendor management. Positions to be located in various countries worldwide. If you are interested in joining our enthusiastic team, please send your CV and cover letter.